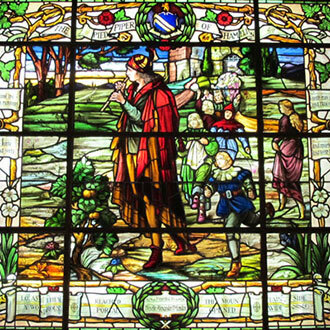 When the "Pied Piper" window was installed in the Browning Room of Carroll Library in 1924, Dr. A. J. Armstrong staged a "Pied Piper Festival" on the Baylor campus. Four hundred Waco school children, dressed in rat costumes (some were white, some gray, some brown, some black), hid in the bushes and doorways of buildings along the Burleson Quadrangle, and a Baylor student, dressed as the Pied Piper and playing a flute, lured them into a procession around behind the buildings and out of sight of the crowd of spectators. The children then doffed their rat costumes and played out the second half of the story as "children." Thousands came to see the performance and to hear the ceremonies of the dedication of the window. The donor wanted the window to be a reminder of "the sanctity of a promise," as prescribed in the last few lines of the poem. The window is the focal point of the Sturdivant Alcove of the Leddy-Jones Research Hall. And ere he blew three notes . . . .
And sparkling eyes and teeth like pearls . . . .